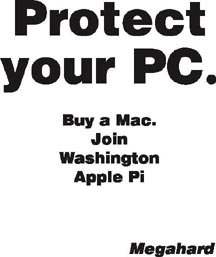 "Space donated by Washington Apple Pi as a public service." As far as advertising goes, the ad was both a hit and a miss. It was large and dramatic, which is good. People noticed it, which is also good. 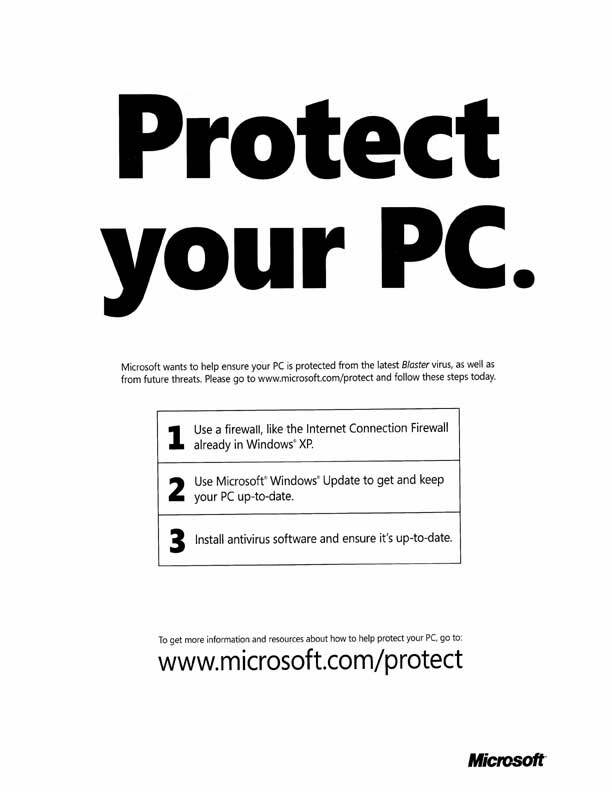 But Microsoft repeated the ad with no changes in text, which was a missed opportunity to expand on the theme. Among other things, the theme itself wasn't clear: exactly what was Microsoft trying to say? What was the context for these ads? The week of Aug. 17-23 was "The Week of the Microsoft SoBig and Welchia Worms," and it followed hard on the heels of Aug. 10-16, which was "The Week of the Microsoft Blaster Worm," which in turn was just a few weeks after "The Month of the Microsoft Slammer Worm." Perhaps Microsoft was advertising a challenge? There is also a possibility that Microsoft was issuing a legal notice. 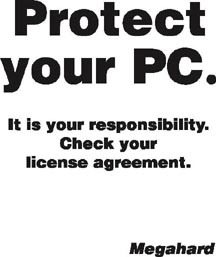 If you've ever read Microsoft's famous EULA (End User License Agreement), you are aware that, by purchasing and installing their software, you are absolving them of any legal responsibility for their software. They have the right to sue you; you have the right to be sued. So maybe the ad was simply a recitation of the EULA. It is also possible that this was the opening salvo in a new "lifestyle" ad campaign. For a couple of years now, Apple iCEO Steve Jobs has been talking about the Macintosh as the centerpiece for a "digital lifestyle," so perhaps Microsoft was staking a claim for a Windows lifestyle. 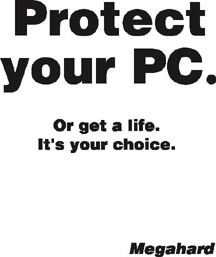 Of course, the recent onslaught of Internet-borne epidemics infecting the Windows world is hardly something new. There are now over 70,000 Microsoft Windows macro viruses; Apple can boast of a measly 35 to 40 viruses specific to the Mac operating system-- and those only work with older Macs. Macs also lag far behind (to be honest, they are completely out of the running) in world-spanning, business-smashing worm infestations; so far, this is almost exclusively a Microsoft Windows phenomenon. Given the magnitude and scope of the issues involved, perhaps Microsoft was making a plea. 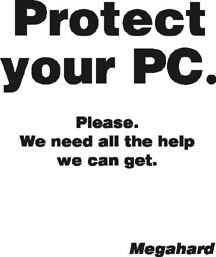 Several (thousand) editorials have also suggested that Microsoft is essentially relinquishing their role in Windows security, putting the "personal" back in "PC" by assigning security to the user. 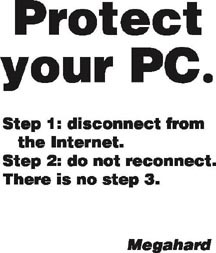 Others have suggested that Microsoft's ad was just a first step. 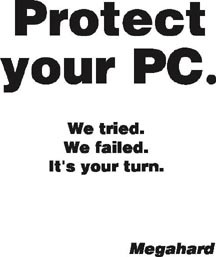 The only product mentioned in the ad is the recent Windows XP, though most of the security issues also apply to Windows 2000, Windows ME, Windows 98, Windows 95, Windows NT -- in fact, every version of Windows since Windows 3.1. Given these facts, Microsoft might consider producing a follow-on ad that addresses the security issues in a more comprehensive fashion. Information technology (IT) professionals fall into two different camps when it comes to protecting Windows. On the one hand, using Windows ensures full-time employment; millions of person-days were expended in August patching Windows, repatching Windows, patching Windows yet again, and recovering from disasters that afflicted unpatched or partially patched Windows machines. On the other hand, a large segment of the IT community got royally sick of Windows; this second segment suffers under the delusion that computers should be used for something other than receiving patches. 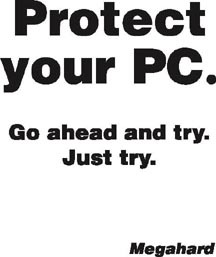 Perhaps the ads were designed to reassure IT professionals that their jobs were secure, and convince Windows home users that they should seek professional help. After reviewing all these possibilities, it seems clear that Microsoft's ad was a good beginning, but that at least one more follow-on ad is required. Advertising is more of an art than a science, but the fact is that most home and business users really have no great interest in protecting their computers. They didn't buy a computer in order to assume a new burden. 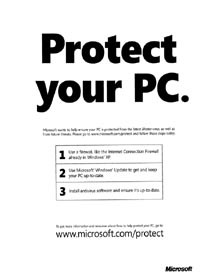 To reach this huge segment of the user community that simply wants a computer that works, and wants a computer that is better able to protect itself, Microsoft should run at least one more ad.